Are you waiting for the time when you can get all your dreams true? If yes, then cheer up. Your wait is Over! Aries Season is here with the sun visiting the first zodiac sign, Aries. The assertiveness of Fire and happiness of Spring will be on full bloom from March 19- April 20. Aries will empower all the zodiacs this season with its courage, determination, and vigor; giving them the power to achieve whatever they desire. Aries season is the most prosperous time of the year when you can see the bloom of fresh new buds and the positive flow of energies around. You will feel the sign of Fire and headstrong Ram filling you with the courage to follow your secret passions and wildest desires. This will be the season to achieve those milestones that you were always afraid to fight for. The Fiery Aries is asking you to take part in this biggest celebration of the seasons. You can make this season more fruitful by focusing on your strengths and plan according to Monthly Horoscope Predictions. Let's learn how you can maximize your strengths with the energy of Aries Season. You might have lived in the fear of failure whole your life, but arise and shine. Aries season has come with the infinite possibilities and positive energies which will give the extra push to your every initiative. You need to realize what is your passion and begin to work on it. Keep your fears, doubts and negative energy aside and understand that in the shadow of fear, you can never prosper. Following your passion is the only element to live a fulfilled life. Read your Aries daily horoscope! Aries energy has come up with courage and determination. You need not to worry; just dare to compete and make the first move towards your dream and you will see the Ram removing obstacles in your journey. Aries comes with the cherishing spring. A time which rejuvenates the earth with its positive aura. Feel this positivity inside you and grab all the coming opportunities with a positive outlook. Aries is the zodiac which blesses you with confidence and a go-getter attitude. Show the charismatic side of your persona, read good books, meet the people who support you and fill your life with positive vibes. The excellent trait of communication comes with Aries, so even if you are not good with words, make the first approach to communicate. Get a personal tarot report in love, money, and more. Aries commands this season and all the zodiac will follow its positive vibes. So, trust your instincts and have faith in every small indication that can change your life for good. You need to realize your worth this time. Meditate and take your time to relax and think what you are made of and what makes you different from others. Don’t let anyone tell you that you are not worthy. Remember no one can make you inferior without your consent. Read this now: How Your Love Life is Going To Be Like In 2019? Aries symbolizes the beauty of nature which is incomparable and incredible. You are born out of the same nature, so start telling yourself that you are beautiful and you have the power to make everything beautiful around. Let not your self-respect and confidence be traded for anything. Be limitless and let this Aries season take the charge to get the best out of you. Fearlessness is what Aries is known for. If you have ever restricted yourself due to unknown fears of life, this is the time to bring your adventurous side to the fore. Take your bag and go on the long-held trips, visit new places, meet new people, start your venture and do whatever looked tough or impossible for you. The Fire sign of Aries is now in action so let the warmth flow into your veins and spur you into action. You need to learn how to conquer your fear and lead the life which could fill you with more action and adventures. Want to know what’s coming up? Read your Daily Tarot! 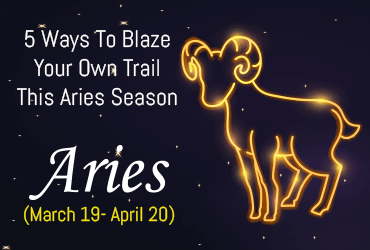 Even if you are a person with a calm nature, Aries has given you a chance this season to get plugged with the high spirit of taking risks. Follow your passion and awaken the inner joy that makes you feel alive! With all the actions and adventures, Aries energy doesn’t allow you to slow down. You need to learn how to handle the stress and work with passion alongside. Taking time for yourself and enjoying a break every now and then is also equally necessary. The Aries cardinal sign creates a strong connection with the body. So, pamper yourself with your favorite icecreams, spa sessions or dance classes. Cook whatever you want and spend time with your family. Aries season has brought the fortune Spring here. So, make the most earnest efforts to make all your dreams turn into reality. Your fearless first move, confident efforts, calm soul and adventurous spirit all will make the Universe cheer for you!